In which Kathryn and Jenny get their nails done at a Chinese salon, speaking only 2 words of Mandarin between them. We asked around at a variety of shops (okay, we got our Chinese-speaking roommate Sarah to ask for us) and prices ranged from 200-500 RMB (203-508 TTD) which seemed exorbitant because everyone knows my amazing nail tech Solange does my nails in Trinidad for 150 TTD. Finally, Sarah and Jenny found a place that did gel manicures for a cool 110 RMB plus 20 RMB to soak off the original gel polish. On return visits, you wouldn't have to pay the soaking off cost. We were sold. So off we went to the Gongcun Miyamura Styling Salon without our Chinese translator, Sarah. But we didn't need it. My favourite experiences in Shanghai so far have been when Chinese people and I both make an effort to communicate with each other despite not speaking the same language. And that certainly happened here. After a couple of awkward tries to mime that I wanted my nails "shorter" to the male nail tech, he produced a translator app on his Samsung, typed in some Chinese characters, pressed Enter and the English words "Shorter, right?" appeared on the screen. 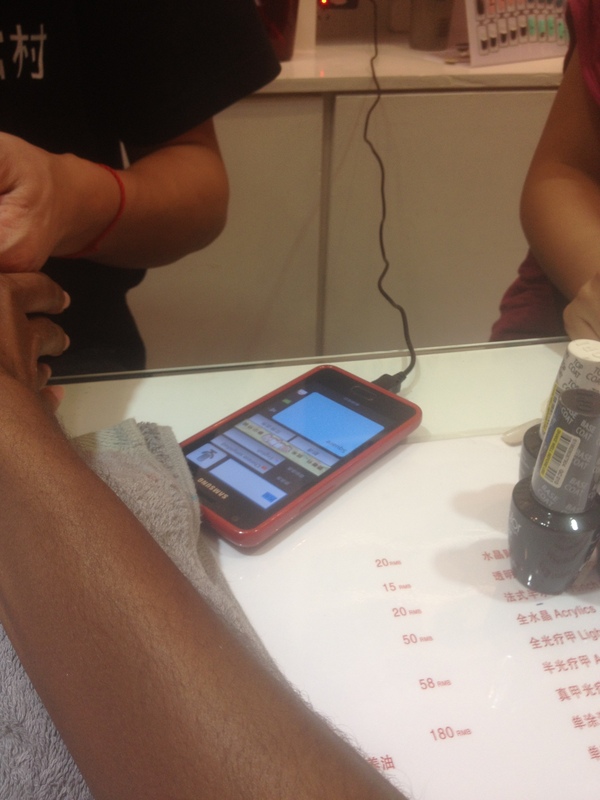 (Oh here, some interesting things about the Chinese salons I've seen so far. Men do most of the hair and clearly some of the nails here. This particular salon did both hair and nails and men dominated it both as employees and as customers. There were a variety of men getting their hair cut or coloured, and what's more, a dude calmly and confidently walked to the back of the salon to where we were getting our nails done and sat next to us for his own manicure. No gel though. In addition, at Chinese salons they don't shampoo hair, with the head reclined in a sink under running water. They seem to wet the hair and then do the shampoo with the client sitting completely upright in the chair with all the foam and shampoo on their head and THEN take them to rinse it. Maybe to conserve water? I don't know). The salon had a great selection of regular OPI polish, so great in fact that I briefly considered rebelling against the gel manicures I had been so loyal too over the past two years and going with a regular colour. But when I thought about how annoying regular nail polish is I changed my mind. I know many of you are familiar with the gel manicure by now but for those of you who aren't, gel manicures when applied to the nails do not dry, they are "cured" under a UV light. Drying time is considerably cut down and when you leave the salon, your nails are completely dry. It is my opinion that all coats of a traditional manicure don't completely dry till 24 hours after application and I am a MASTER at ruining a manicure, 3 and a half minutes after I have paid for it. In addition, gel manicures are resistant to chipping and flaking, and if properly taken care of last an average of 2 weeks (I can go three weeks before mine start to grow out). There are some drawbacks to gel manicures though. I am convinced that all that UV light exposure can't be good for the skin in the long run and gel polish has to be soaked off in acetone which can be quite a time consuming process. Poor Jenny. Her original manicure was so resistant to the acetone that her nail tech had to spend a long time filing the whole thing off. Anyway, I digress. 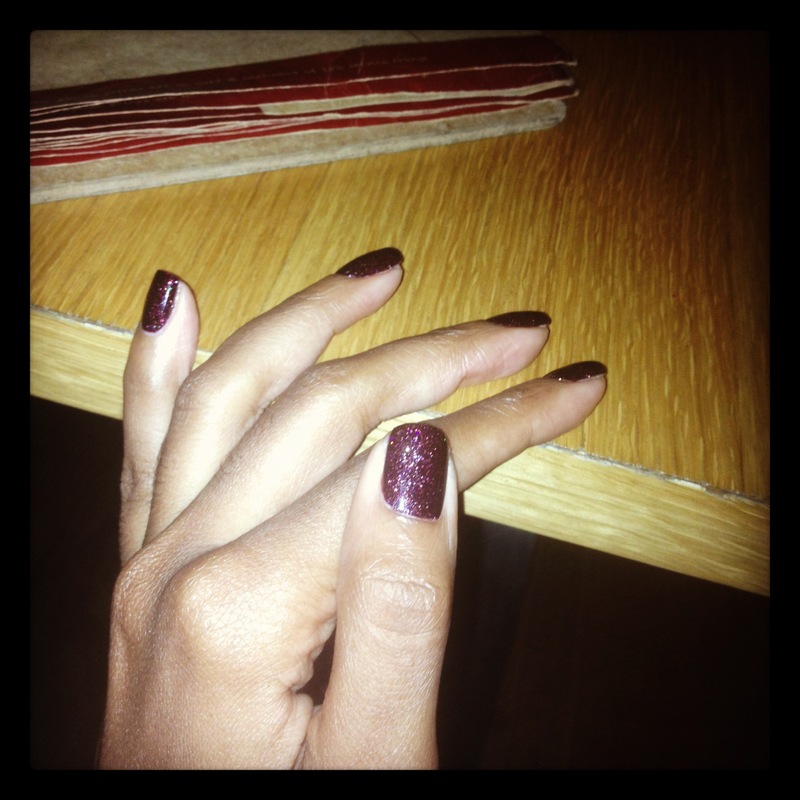 I ended up picking a deep plum colour with glitter ( I LOVE glitter!) and sat back for a great manicure experience, (full manicure, hot towels, the works!) all the while communicating with the tech through his app on Samsung. His technique was a little different from Solange's but the results were amazing and I am going back for a pedicure tomorrow. I wanted to show him how much I loved it, and offered him a tip, which he declined as I expected (there's no tipping culture in Shanghai and they do turn down tips more often than not) but he got the idea. As I write this, I am downloading my very own translator app (don't know why I didn't think about this before to be honest) to make all my future Shanghai experiences as easy and enjoyable as today's was! Solange gyul, yuh have some competition in Shanghai!